Boards do not have to be boring! 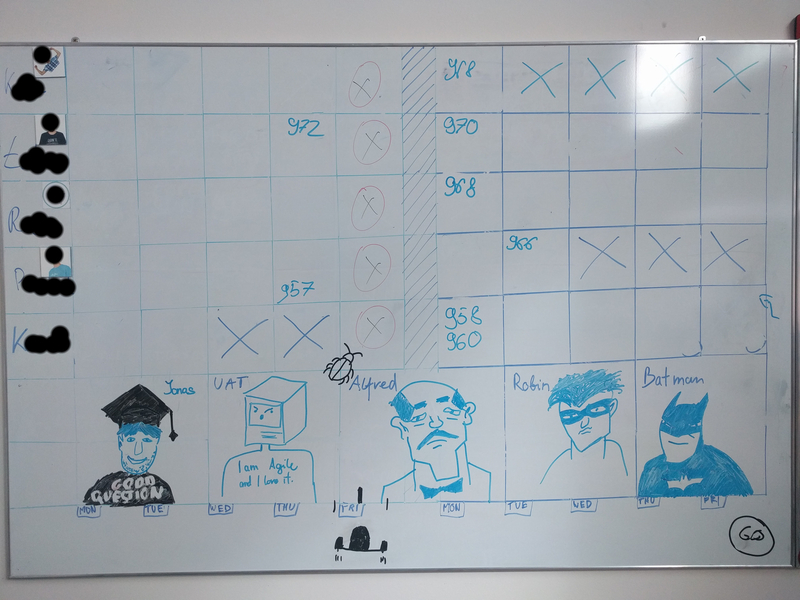 Today I would like to showcase a bit of my creative spirit and by example explain the evolution of a team's board used for daily re-planning activity during Daily Scrum. I specifically do not use the term Kanban Board because the way I designed those boards might be unorthodox to say the least. What's this all about, you might want to ask? Well, the guys are having fun with the Marshmallow Challenge but the photo bomber is this Kanban board in the background that the team used to have. I mean no-one would possibly know the state of affairs in the sprint even when examining it with the highest attention possible and from the closest possible distance. All right. Now let me guide you through the board and explain the simple principles behind it. On top, you have a Sprint Goal clearly expressed in one short sentence. On the left, there is Priority axis thus all items/User Stories/PBIs/tasks or whatever you might want to call them on the board are sorted from the highest priority on top to the lowest priority on the bottom. One line of those small paper cards stands for one User Story. It is explained in the first card on the left hand side, which also bears the score expressed in Story Points on it. The cards that follow are subtasks for the User Story. Little clouds mean who from the DEV team has picked up the task. Now, the colors have a meaning as well. The yellow ones stand for Software Developers and green ones (on their request) for Quality Engineers. One task can have several clouds at the same time i.e. pair programming, helping colleague from the team out or sharing knowledge. We show the current task with the red dot and completed tasks with "V" sign. The completed story line is cleared and moved to the square "Closed PBIs". PBIs stand by the way for Product Backlog Items. Now, the second generation of this board is a tad better. The team introduced magnets to highlight blocked items. Quality Engineers' tasks are in green to separate them from the development tasks. We also agreed on a short name for each user story, as everyone was calling the particular User Story a bit different but no-one had really the patience to repeat the whole sentence of the User Story each time we spoke about it. Please excuse the quality of the photo but it was the only one that survived. Still one can see that there are number of improvements here. First of all we have hourly estimates for each subtask written just below it, updated during Daily Scrum. The task gets done, so does the progress bar, which is then filled with black color completely. Oh, and there are no paper cards. It is all hand drawn and thus very flexible. Printing and cutting all those cards was not very environmentally friendly and took a lot of time, so I decided to draw them and have lots of fun while doing this. As you see the boards do not have to be Kanban style to add value. You can use creativity to visually facilitate information and create information radiator, which with glimpse of an eye is open for quick interpretation to anyone. When designed well, they can be very helpful for the team to assess progress daily and inspect & adapt accordingly. Of course there are many ways to design the board, here is a hint how you can do it differently with a focus on sprint time and DEV team members. The "X" marks mean the time in which the team member is unavailable. The numbers on the other hand, stand for User Stories taken from JIRA. The day in which the team put those User Stories, mean they should be completed till Daily Scrum on that day. Just below you have a visual representation of the five test environments, where we would put a magnet with DEV team member photo so that everyone knows it is being currently used and by whom.